Well, if you've managed to be patient with me, here are the results of the Final Four. Philadelphia manhandled San Francisco with a 10 game blowout, and New York squeaked by a plucky Texas team. 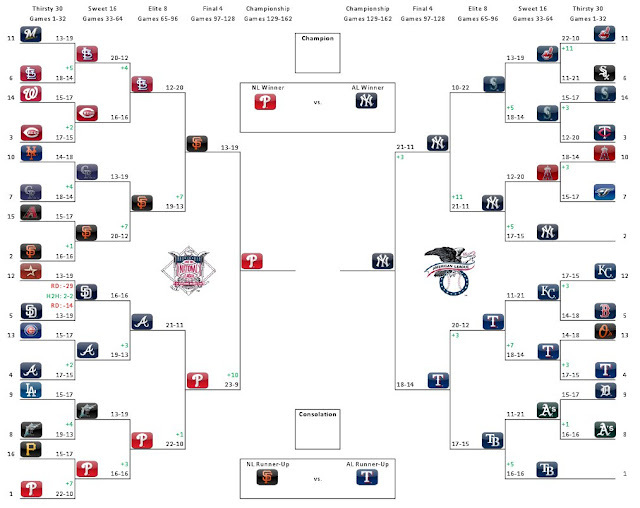 The Tournament Finals look like what everyone thought the World Series would be: (1) Phillies versus the (2) Yankees. The Consolation Game is a rematch of last years World Series with the (2) Giants facing off against the (4) Rangers. I will post the final results sometime during the World Series, but based on the rules I set up, we all know that Dawgbones and Dan the Sticker Man are guaranteed prizes. All that's left is finding out who gets Show.